At Rutgers, classroom and laboratory teaching and advising are our highest priorities and students benefit from a low student-to-faculty ratio. Our expert faculty members hold PhDs from some of the most prestigious engineering programs in the country. Nearly a third of our professors are women. Our Chemical and Biochemical Engineering program combines classroom and laboratory learning with research and many opportunities for innovative, practical training. Our state-of-the-art labs give our students the resources to conduct research in areas including fermentation, distillation, pharmaceuticals, process engineering, biomedical engineering and biotechnology. Students use cutting-edge software to perform and interpret computationally intensive simulations and to visualize complex data representations. Our dedicated faculty members are engaged in cutting-edge research in the areas of pharmaceutical science and technology, life sciences engineering, including biotechnology, biomolecular engineering, tissue engineering and the design, manufacture and applications of nanostructured materials. Our undergraduates have many opportunities for research under the guidance of a faculty adviser. Many do field work in the US and abroad. We maintain close ties with leading corporations, including Dupont, ExxonMobil, Hess Corporation, and Merck, who support our undergraduate programs with research and on-site training opportunities and advisement. 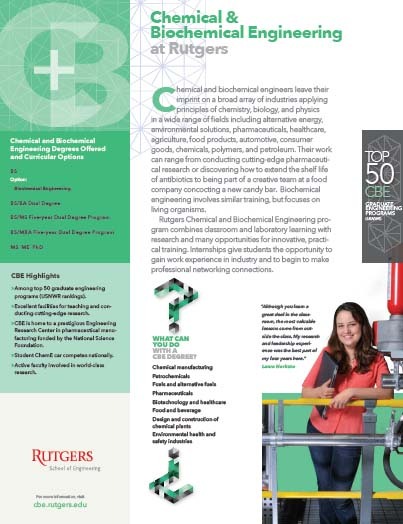 Rutgers offers a combined bachelors/masters degree programming, combining a BS in chemical engineering with either an MS in chemical engineering or an ME in pharmaceutical engineering. Students may also earn a combined BS and MBA degree. Internships, full-time during the summer or part-time during the semester, give students the opportunity to gain work experience in industry and to begin to make professional networking connections. Students who participate in the co-op program work full time for six months in a corporate engineering position and earn credits towards their degree. Students who participate in these programs are often offered full-time positions by their sponsoring companies after graduation.